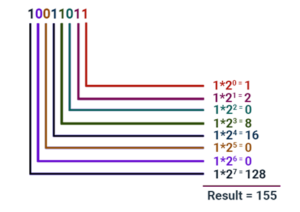 In mathematics or Digital Electronics, the binary number is taken as the number that is simply expressed in the binary form simply one (1) and the zero (0). The base 2 is the subscript value that is given as the radix. The most popular application of binary number system can be seen in electronics circuits where logic gates are implemented. Here, every single digit is taken as the bit. To understand, binary number system in mathematics, you should know how it works? Microcontrollers are also utilizing the binary number system for logical computing. Let us see some of some of the interesting facts for a quick understanding of the binary number system. The term binary signifies two and it is generally used prior to English words like binocular, bicycle etc. When we write any binary number, for example – 001, then it is taken as “zero-zero-one”, not as a single number. There are two binary numbers, zero and one, and every number is called a bit. If you want to check if the number is binary or not then don’t forget to check it with a little two after the binary number. If we talk about the circuits then circuit voltage is given in two states (i.e. on/off) where zero is considered as the input value and one is considered as the output value. To convert binary to decimal the following chart. The conversion of decimal to binary is an easy process but you should be extra cautious because they should not be mixed together. For example, if it is written 10 then it could be spoken as either ten in decimal form and “one-zero” in the binary form. The best idea is to check the little two to make sure either number is binary or not.Here, in the example below, we have given a complete idea of how to convert any binary number to decimal. Start from the back with two raises to the power zero and continue the process by adding one every time into power value. The conversion from binary to decimal was easier as shown above in the example. In the same way, you can convert decimal to binary as well with a proper format then write the remaining values in zero and one form together. The same process is followed by the computer system, microcontrollers etc for logic computation where each input is converted to binary form first for processing then against converted back to your language as displayed in front of you. q is the base value that starts from most significant digit order qn to least significant order q-1, q-2, …..
Binary to decimal is easy but converting a decimal number to binary form is generally time-consuming and should be taken care of wisely. You should divide the number continuously until it is converted completely to zero and one form. Once done with the process, note down the numbers in the reverse order to give it a proper format. With a little practice and knowledge, you can make the conversion process much easier than your expectations. Question 1: Convert 25 in to binary system? Given decimal number is 25. Divide this number by 2 until the reminder is 0 or 1.